Denver Regional Transportation District (RTD) provides local and regional transit in the greater Denver Metropolitan area. RTD covers the cities such as Denver, Boulder, Longmont, Aurora, Englewood, Lakewood, Littleton, Arvada, Westminster, Thornton, Commerce City, and Brighton. 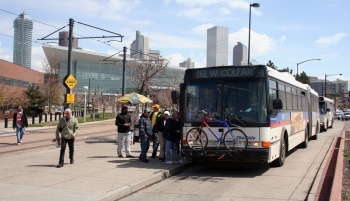 RTD operates buses and light rail and commuter rail.